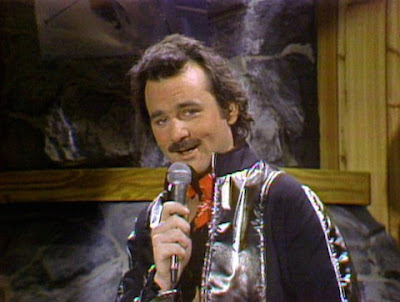 Stephen W. Terrell's (MUSIC) Web Log: WACKY WEDNESDAY: Happy Birthday Bill Murray! Bill Murray is 66 years old today. He was born in Evanston, Ill.
Let's honor him in song with some of his classic bits as Nick the Lounge singer. (His last name changed depending on where he was playing.) Decades after Murray left Saturday Night Live, Nick remains one of the most popular that show ever produced. Rolling Stone wrote of Nick: "For all his schmaltz, Murray put real heart and soul into this crooner — no matter how miserable the dump where he's singing, he wants to win the audience's love, one rendition of the Star Wars theme at a time." This clip allegedly is the first Nick sketch ever -- before Saturday Night Live when Murray was part of the Second City comedy troupe. But Nick will always be best remembered for his rendition of a certain 1970s science-fiction theme. Did he scare you as much as he scared me?